Buffet dinners are excellent for restaurants who offer catering services. They allow restaurants to feed the maximum amount of people with minimal staff. Some foods are better suited for buffets than others, such as pasta, roasted meats, platters, and appetizers. Desserts that can be made in large batches, like cake, crisps or cookies are also a good option for buffet dinners. It's important to check menu prices periodically, to adjust for rising costs of ingredients and labor. As with a regular dining room menu, it is also important to update catering menus each year. If certain buffet items aren't selling, it's time to nix them and add new, more fashionable choices. Note that the prices listed are just suggestions. They do not reflect current market prices or fluctuations in prices due to location. Classic Dinner: Our most popular buffet choice. 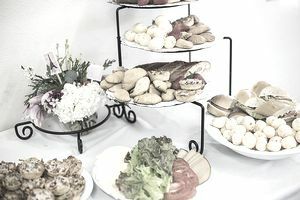 Included with this buffet are two entrée choices, choice of starch, seasonal vegetable, tossed salad with dressings, warm rolls and butter, and a beverage station. $15.95 per person. Please refer to the entrée choices below. Light Dinner: Included with this buffet are one entrée choice, choice of starch, seasonal vegetable, warm rolls and butter, and a beverage station. $12.95 per person. Please refer to the entrée choices below. Italian Pasta: Includes a tossed Garden Salad with dressings, linguini tossed with olive oil and garlic, and choice of three sauces: Classic Meat Marinara, Creamy Alfredo, and Vegetable Pesto. Also included are savory garlic bread and a beverage station. $13.95 per person. There are many other kinds of buffet options, including food stations, build-your-own stations, carving stations, and dessert bars. Having clear catering policies help prevent any misunderstanding between the staff and guests as to what is expected during the event. Our banquet room is available for private parties of 15 or more guests and holds up to 100 guests. There is no room fee for the use of our banquet room. A $100 deposit is required at the time booking. The remaining balance for functions is required at the conclusion of the function unless other arrangements are made in advance. A guaranteed number of guests (final count) are required at least one week in advance. This will be the number of guests for which food is prepared. Accordingly, this final count will also be the base for the amount that parties will be billed. No food from other vendors may be brought into the event hall, with the exception of wedding cakes. There is a $50 cake cutting fee, which includes cutting and serving cake to guests. Due to health codes, no buffet food may be taken home following an event. Having clearly outlined policies for the use of your function room is important so that there are no unpleasant surprises (or costs) for the customer at the end of the event. Depending on your restaurant's location, catering room fees and other service fees may be higher.